Hello, my friends! How are you today? Many plans for the weekend? I certainly hope this brick cottage brings you some joy! 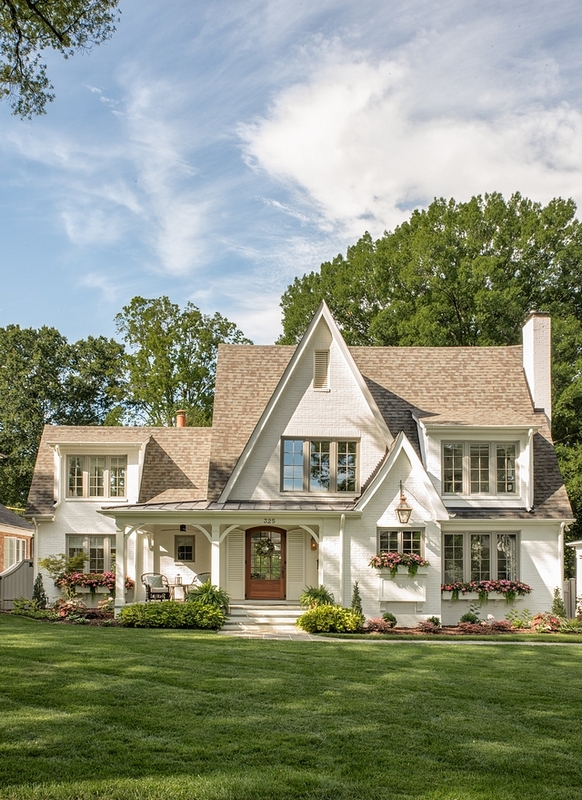 Recently built by Gerrard Builders Hillside House and with interiors by Shannon Bowman Interiors and Carolina Design Associates, this cottage is truly a dream home! In my opinion, it is the perfect size and features interiors and an exterior that will overcome any trends. You can look at this home in ten years and you will think it was just designed. 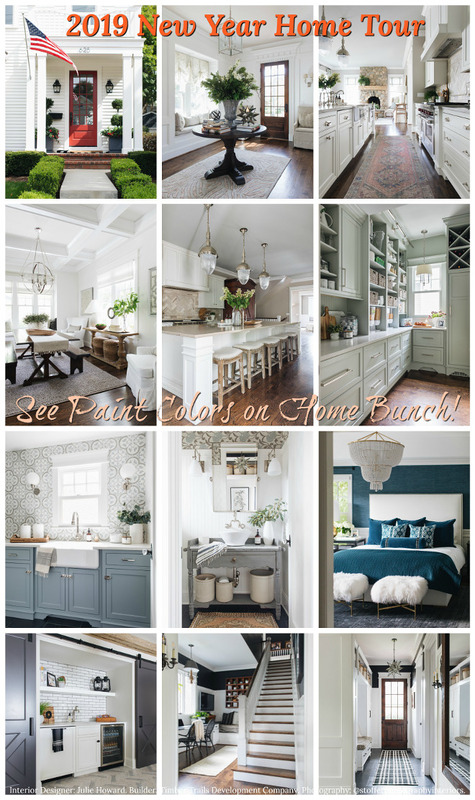 Find a comfy chair and pin your favorite pictures of this cottage with painted exterior. I hope you have a great time! 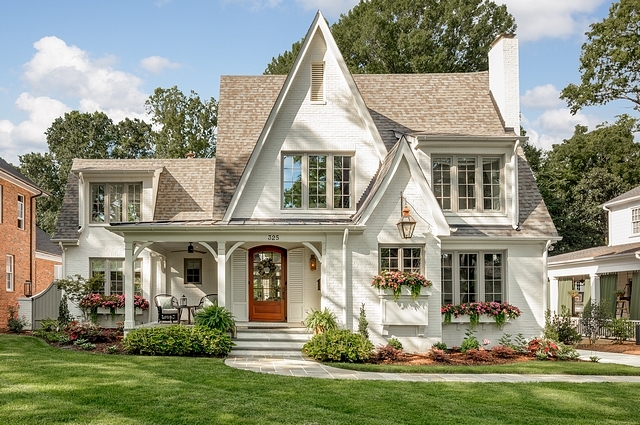 This home’s curb appeal makes a great first impression and the architectural details are impeccable. Gas Lantern: Lantern and Scroll, T-31 in Copper with Aged Brass Internal Parts, Custom Bracket was designed by Shannon Bowman – Similar Lighting: Exterior Lantern & Porch Sconces. Gate and Grey Windows Paint Color: Sherwin Williams SW 7029 Agreeable Gray cut in 1⁄2 for less strength. 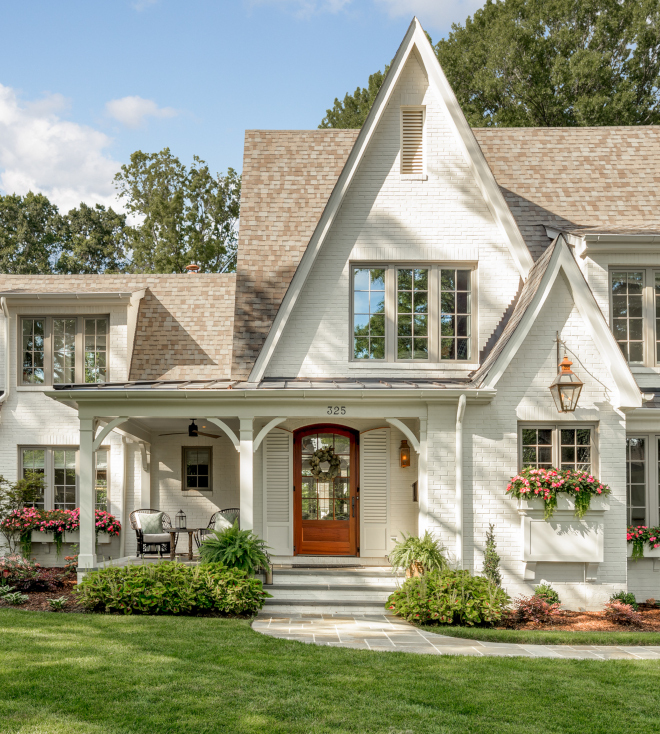 You should pin or save this picture to keep the brick exterior paint color in mind! 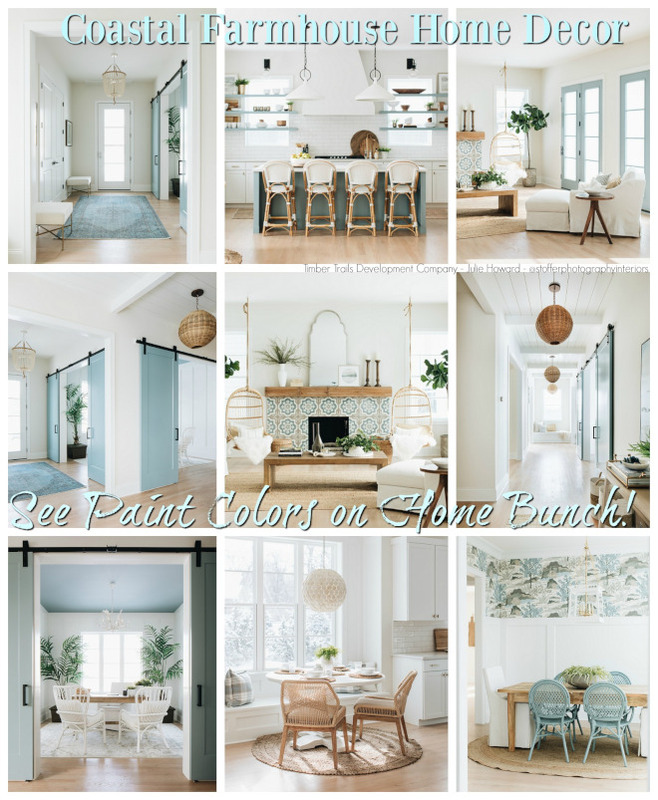 This color is perfect if you are looking for a warm white for your home. 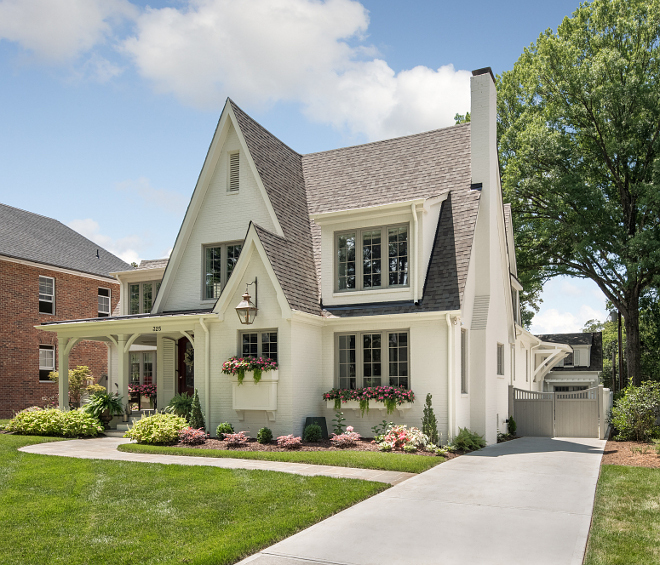 The brick and trim paint color is Sherwin Williams SW 7011 Natural Choice. Custom shutters flank a Mahogany front door. Shutters are Sherwin Williams SW 7029 Agreeable Gray cut in 1⁄2 for less strength. Beautiful Patio Conversation Sets: here, here, here, here, here & here. 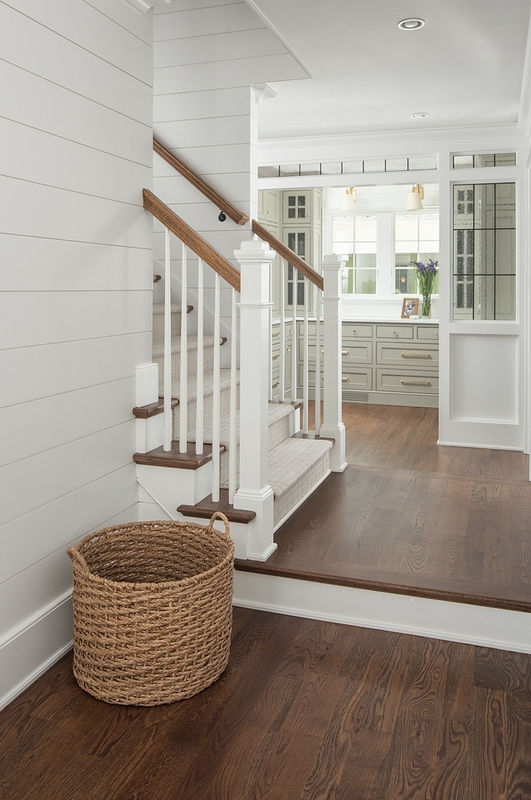 The front door opens to a beautiful foyer with shiplap walls, painted in Benjamin Moore OC-65 Chantilly Lace. Runners: here, here, here, here & here – similar. The millwork is really impressive in this home. Sconces: Visual Comfort Bristol Small Sconce in Gilded Iron. Beautiful Console Tables: here, here, here, here, here & here. 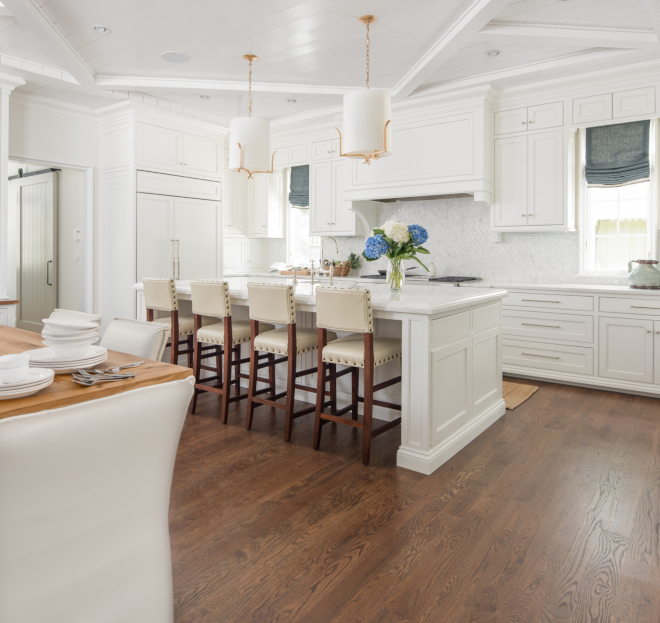 “The kitchen cabinets were built by Hardwood Creations in Charlotte, NC. 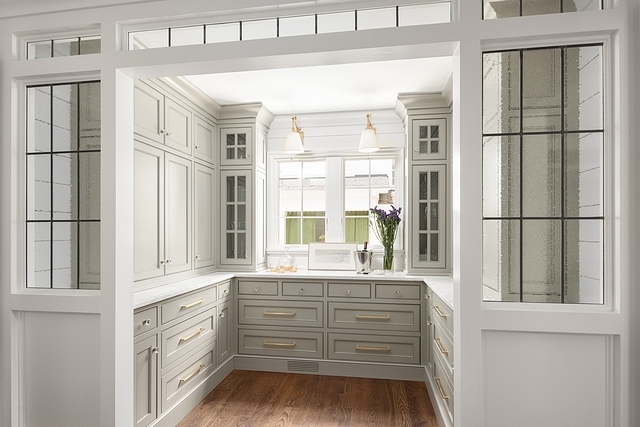 They are paint grade flush inset frames with a recessed panel cabinet doors. The door style includes an interior bead for interest and detail. The smaller top drawers have an outer bead on a slab drawer front to keep the style consistent. We added a decorative and profiled light rail at the base of the upper cabinets to add one more layer of dimension and help hide the under-cabinet lights. 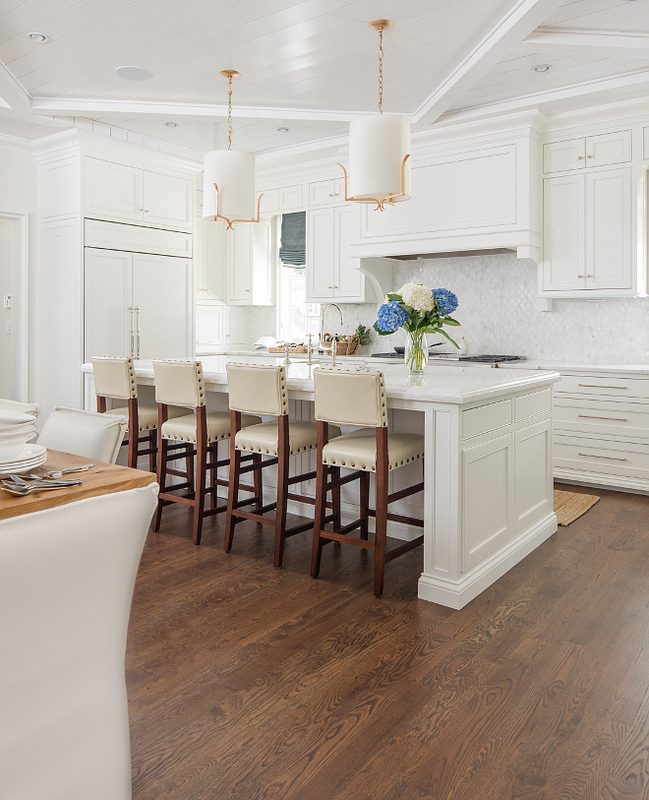 The cabinet hood matches the profile of the cabinet doors in one large recessed panel and includes beaded/cove moldings below to create a low-profile mantel design. The cove corbels that attach the hood to the wall are 3” wide and line up with the overall frame of the hood above. The cabinet base includes a furniture style “proud” base with a decorative cove valance cut out.” – Shannon Bowman. Cabinet Paint Color: Benjamin Moore- OC-65 Chantilly Lace. Appliances: GE Monogram / Subzero Fridge. Roman Shades: Custom, similar here. 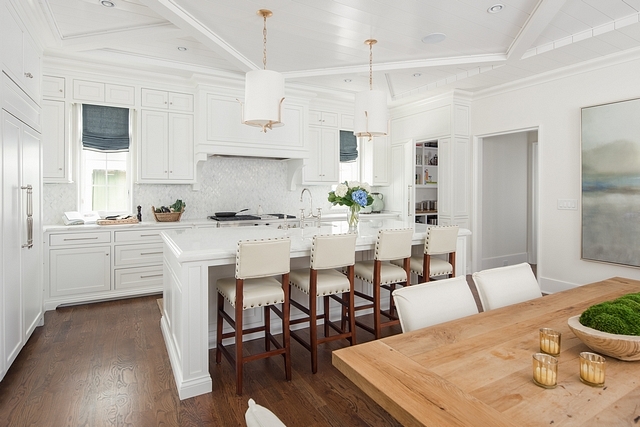 The countertops are Calacatta Florence marble from In-Style. The perimeter countertops are 3cm thickness with an eased edge and the Island is a 2.5” thickness with a Dupont Laminated Edge. All marble tops included the Dupont 15 year sealer to help prevent staining. The backsplash is Roman White Rhombus marble mosaic in the Polished finish from In-Style. Counterstools are Lee Industries – Leather Counter Stool in Ivory Leather (available through designer) – Similar: here – Others: here, here, here, here, here, here, here & here. Kitchen Lighting: Arteriors Hendrik Pendant in Aged Brass – Other Beautiful Lighting: here, here, here, here, here, here, here, here, here, here & here. The kitchen faucet is Perrin & Rowe- Georgian Era Bridge Kitchen Faucet with Side Spray in the Polished Nickel finish. Island Dimensions: 52”W x 110”L. Sink: here & here similar. The wall color is Benjamin Moore OC-45 Swiss Coffee – Cabinets are Benjamin Moore Chantilly Lace. 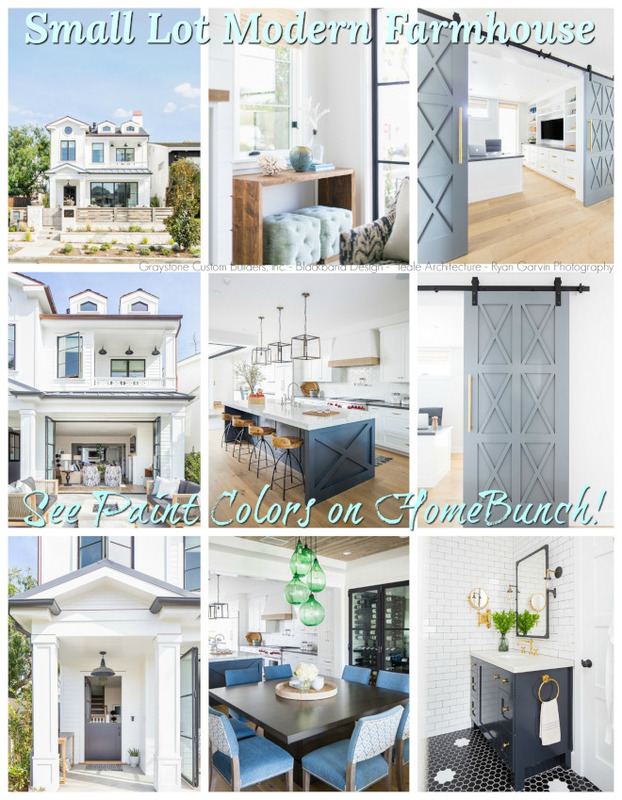 This is a great color scheme to keep in mind! Kitchen Hardware: Cabinet Pulls, Knobs & Appliance Pulls. Sofas: Hickory Chair- Celine Skirted Sofa in an off white Crypton Linen Fabric – Similar here – Others: here, here, here, here & here. Chairs: Lee Industries – (already owned) – Others: here & here. Chests under Windows: Lillian August Basel Chest (discontinued) – Others: here, here & here. End Tables: Noir- 2 Shelf Side Table, White Washed. Lamps on End Tables: Aidan Gray – currently discontinued. Lamps on Chests: Currey and Company Farrington Table Lamp. Rug: Slate Blue Moroccan Rug from Stark Carpets, 10×14. Living room’s Lighting: Arteriors Roxanne Flush Mount – similar here. 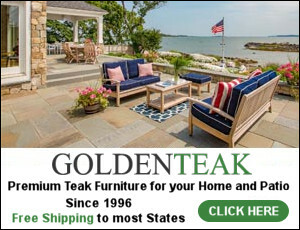 Dining Table: Restoration Hardware- Reclaimed Russian Oak Baluster Rectangular Table in Reclaimed Natural Oak Finish – Other Beautiful Tables: here, here & here. Dining Chairs: Lee Industries Slipcovered Dining Chair with Flanged Edges. We used a faux leather for the slipcovers, Pindler & Pindler- Pattern= Rawlins, Color= Ivory – Others: here, here & here. Drapery Hardware: Aria Metal Hardware in Aged Brass- similar here. Drapery Fabric: Pindler & Pindler Jefferson Linen in Slate Blue. Band Trim on Lead Edge: Highland Court Wide Tape, Ivory – Similar Drapery: here. Ottoman: Stanford Furniture- Custom tufted ottoman- drawn and built for storage. Completed in Pindler & Pindler: Textured Faux Leather- Pattern- Calhoun, Color- Sand – Others: here, here & here. Pillows are custom – Other Beautiful Pillows: here, here, here, here, here & here. 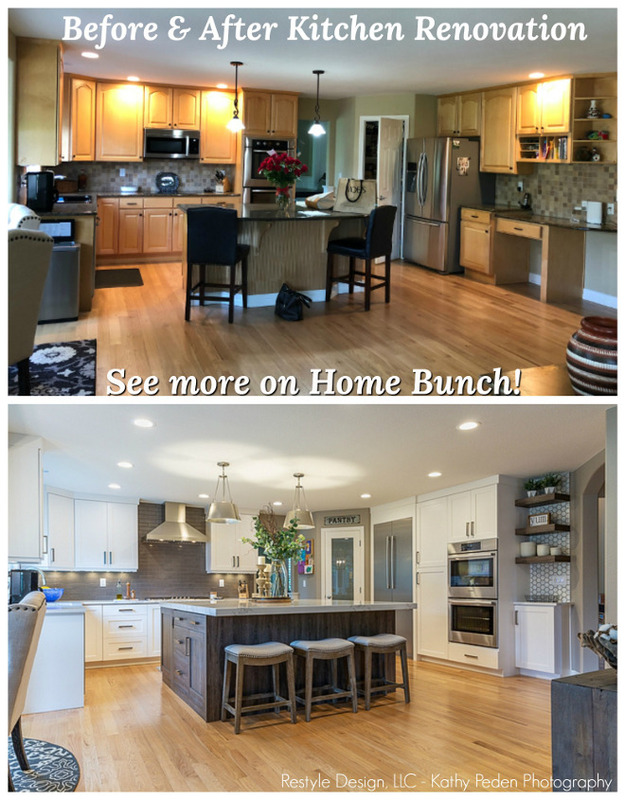 The butlery is located just off the dining room and it features custom grey cabinets. Lighting: Visual Comfort Graves Pivoting Sconces in Aged Brass, Hardwired. 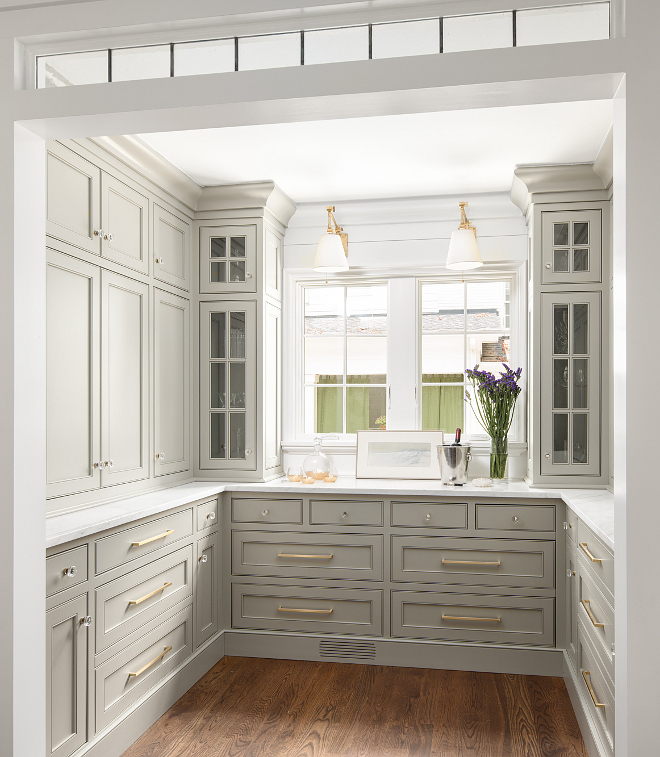 Grey Cabinet Color: Sherwin William SW 7640 Fawn Brindle. Powder Room Cabinet Color: Benjamin Moore HC-166 Kendall Charcoal. 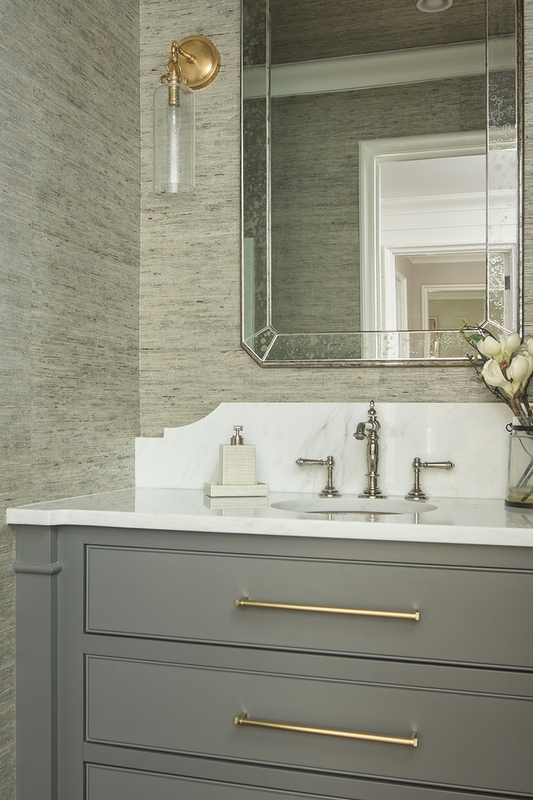 The formal powder room faucet is Kohler- Artifacts Column with the lever handles in the Polished Nickel finish. Lighting: Visual Comfort Katie Small Cylinder Sconce in Hand Rubbed Antique Brass with Seeded Glass. 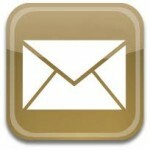 Cabinet Hardware: Rejuvenation 12″ in Aged Brass – Others: here, here & here. Beautiful Mirrors: here, here, here & here. The wood flooring is a blend of 3”, 4”, and 5” White Oak, common grade. The stain is a custom blend of Dark Walnut and Weathered Oak – similar here, here & here. Beautiful Baskets: here & here. 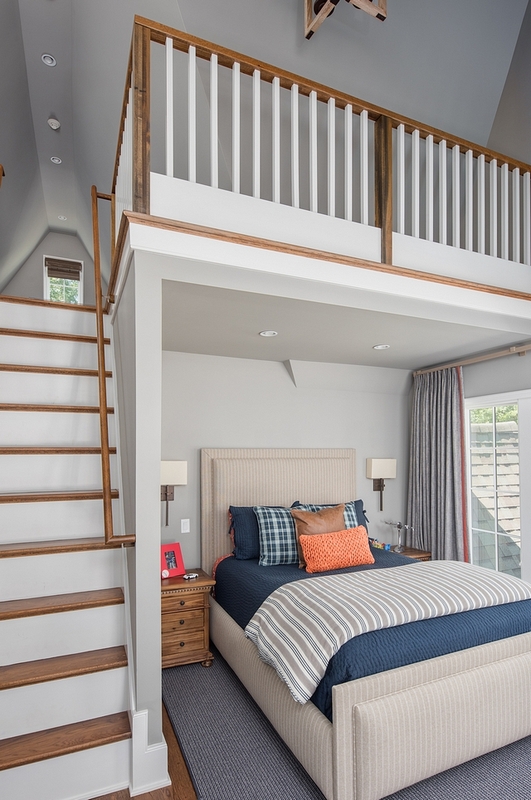 How incredible is this loft kids’ bedroom?! I am also loving this “classic-with-a-twist” design. Bed: Custom – similar here & here. Navy Quilt: here – Others: here, here, here & here. Beautiful Striped Duvet Cover: here, here, here & here. 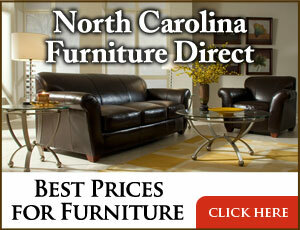 Nightstands: Wayfair – Others: here, here, here, here & here. Similar Pillows: Shams, Plaid Pillows, Leather Pillow & here. The master bedroom have a very serene and elegant approach. Paint color is Sherwin William SW 7063 Nebulous White. Bed: Hickory Chair- Left Bank King Bed in Antique Ivory with a light blue/gray linen fabric for the headboard – Others: here & here. Nightstands: Gabby Home- Rosalyn Chest in Whitewashed Wood with an Ivory Marble Top. Bench at the Foot of the Bed: Hickory Chair- Courtland Made to Measure Bench in Antique Ivory and a Pale Blue Linen Fabric – Others: here, here, here, here, here & here. Bedding: Custom Made Pillows paired with Bedding through Bedside Manor. Artwork: Custom Art from Shain Gallery, Artist: Kristin Blakeney. Chandelier: Gabby Home Clay Chandelier in Gold. 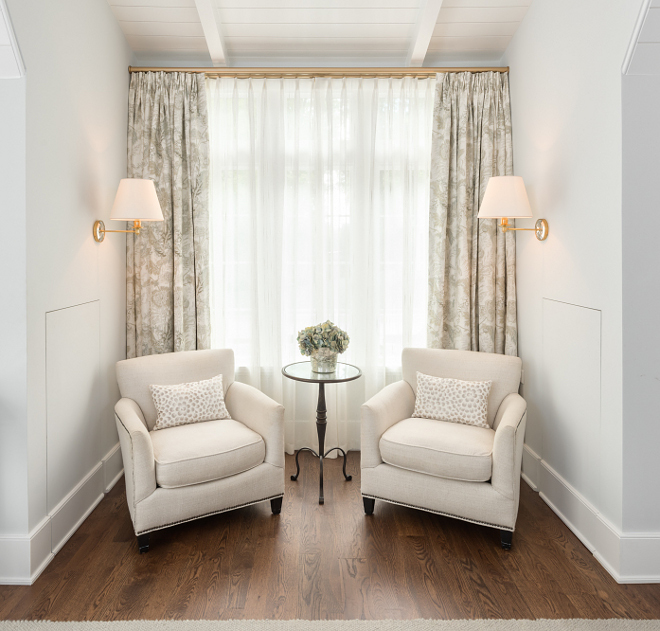 This sitting area feels inviting and very calming. Classic design is always appealing, in my opinion. Drapery Hardware: Kravet Modern Metals Traversing Rod with Crystal Endcaps. Drapery Fabric: Schumacher Sandoway Vine Linen. Sheer Fabric: Kravet Textured Sheer in Ivory – similar here. Beautiful Sconces: here, here, here & here. Beautiful Chairs: here, here, here & here. 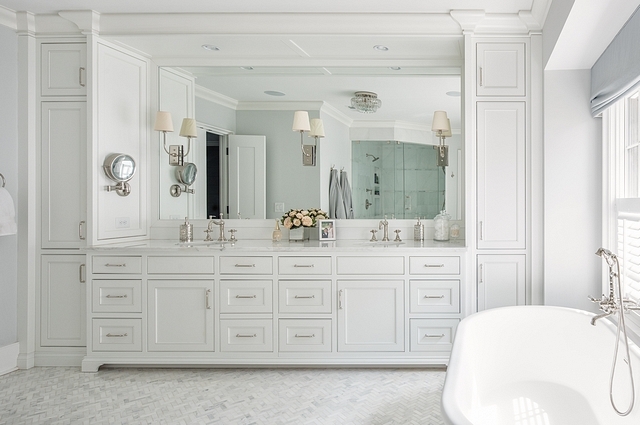 The master bathroom’s paint color is Sherwin William Nebulous White. 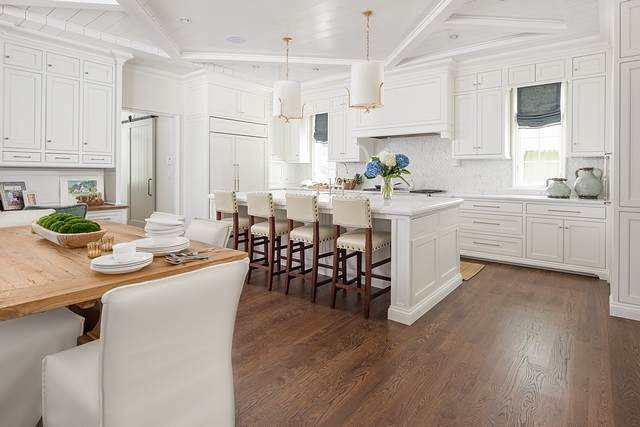 Cabinetry is Benjamin Moore- OC-65 Chantilly Lace. Faucets are Rohl Acqui Column Spout Widespread Lavatory Faucet in Polished Nickel. Shower Tile: Walls: Bianco Cielo Polished Marble in 18”x18” from Walker Zanger (similar here). A contrasting stripe detail between each 18” tile horizontally is completed in Roman White Polished Marble 1”x1” from In-Style (similar here. The bathroom tile floor is 1”x3” Roman White Honed Herringbone Marble (similar here). Freestanding Tub: Tribeca – similar here. Ceiling Lighting: Global Views Mini C Chandelier in Nickel. Hardware: Pulls, Knobs & Barn Door Pull. Runner: here – Others: here, here & here. 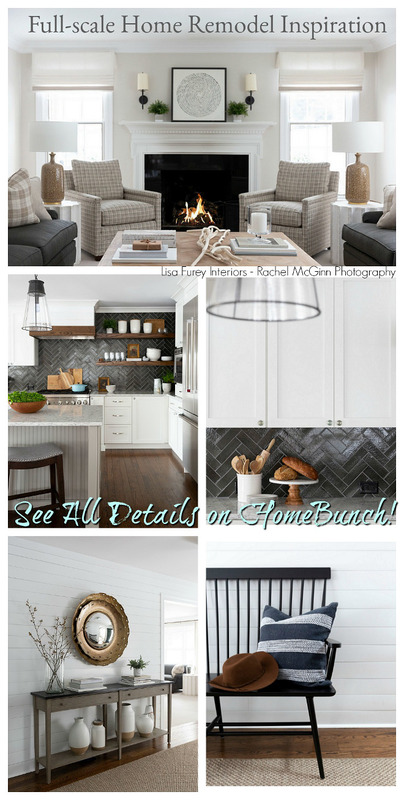 Many thanks to the builder and interior designer, Shannon Bowman, for sharing the details above! Builder: Gerrard Builders Hillside House (Instagram). 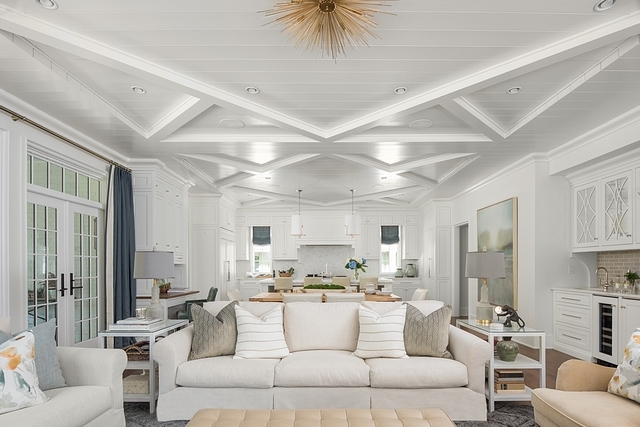 Interior Design: Shannon Bowman Interiors and Carolina Design Associates.